My husband doesn't cook. He makes a mean mac and cheese, but that's about it. I'm all the happier because that means my experimenting has free range! When I think a recipe looks good and attempt to tell him about the ingredients, his eyes glaze over and he says something like, "sounds good?" It's about the same way when he tells me about work with computer chips. So we have our own niches, it's a good thing. ANYWAY, he was actually the one who saw these and sent me a message that we had to make them. Correction, I had to make them. They've graced our kitchen twice now, one of those times was last night. Thanks to book club (we read Major Pettigrew's Last Stand - I loved it) that I hosted, I now have a pan full of these. There may be some unsuspecting people that might get a little treat today...I know I shouldn't have these sitting around! Go to Sweet Pea's Kitchen for the recipe. She has some amazing recipes, including more unique brownie recipes. P.S. I promise I'll be doing a give-away...I decided to paint my whole house, my oldest started Kindergarten, and my baby decided he wanted to be held all the time. We're going through adjustments here. I'm attempting running this morning, as soon as baby wakes up, and I might try my first zumba class tomorrow. I've heard it's a blast! Have a fabulous weekend and I hope you get to work-out too! 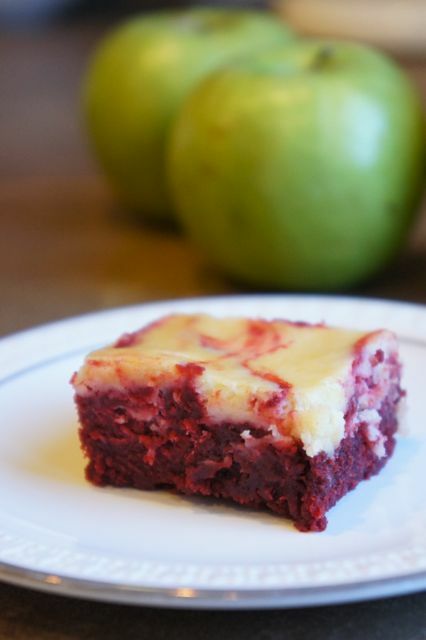 you can stop by with Red Velvet cheesecake brownies ANYTIME! I'm bummed to have missed out on book club. hope you all had a great time. You gonna be dropping any of those by in Salt Lake City?? ?